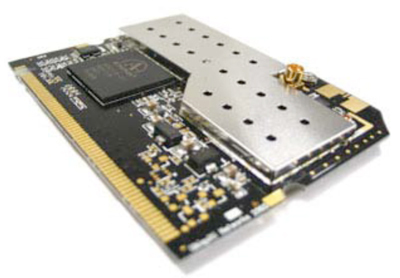 The world's first hi-performance 2.4 GHz 802.11b/g mini-PCI module. With improved output power and sensitivity over standard wireless cards, the SuperRange2 is ideal for mesh networking, telematics, and other embedded applications. Atheros, 4th Generation, AR5213 chipset. Note: This radio card has one MMCX antenna port and one U.fl antenna port.